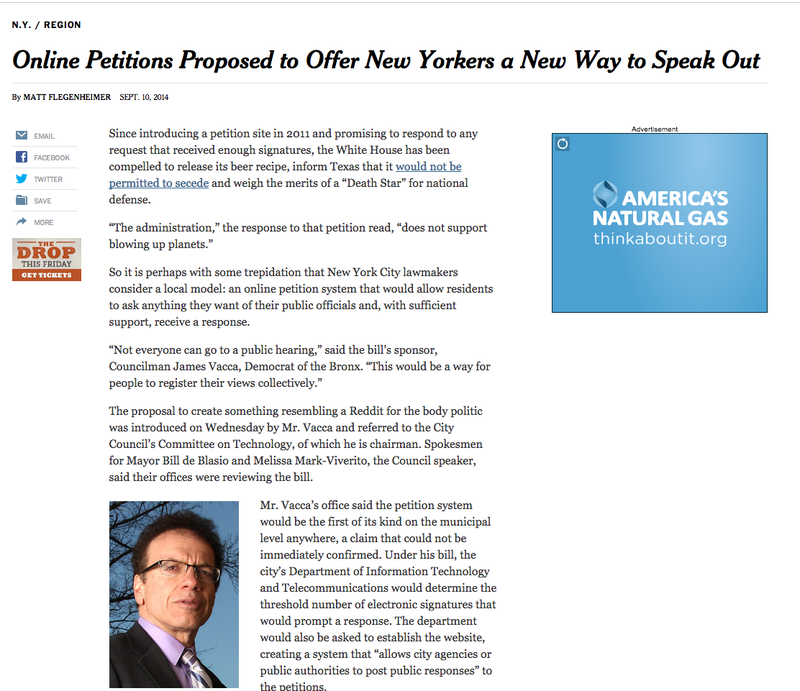 Today, the NYT reported that NYC Council Member James Vacca will introduce legislation to develop online petitions to NYC city council – in short, a version of the White House’s “We the People” for NYC municipal government. NYT article today on NYC online petition initiative. Well golly – sounds good – I should note up front that our non-profit already offers this in a free, open-source, open-data web platform: AskThem. It’s worked since Feb. for all of NYC government (e.g. Brooklyn, Manhattan council members, the Mayor), as well as for every state legislator and federal members of Congress. And we have ten elected officials in NY who are verified responders, committed to respond to popular questions from their constituents – with more to announce soon. I’ll briefly mention that I was pleased that CM Vacca’s staff consulted with me & BetaNYC’s Noel Hidalgo in recent weeks, to gather input on the broad input of such an online petition platform for Council. I volunteered AskThem’s open-source code to remix as always, as well as our findings in question-content and outreach and more, and especially encouraged them to read our non-profit advisor, Prof. Dave Karpf, stellar analysis of best practices in this field: “How ‘We The People‘ became a ghost town”. I’m bullish to see what CM Vacca’s team & the Tech Committee advances – of course, as developers of AskThem, we’re optimistic about the potential of local elected officials listening to the public on a truly bottom-up platform, where any issue can be raised. This offers a significant difference with other “listening” solutions, such as Mindmixer and Granicus’ SpeakUp and others, where the input topics are generally set by elected officials & staffs, as opposed to wholly generated by individuals & organizations – though I won’t go so far as to argue these platforms are unproductive, because they do offer a higher degree of accountability, being operated by official government entities. But they do seem significantly less organic and more restricted in their user experience. Of course, major commercial online petition sites like Change & Causes, and the We The People open-source experiment, came before AskThem arrived for independent petitioning & questions-and-answers with every government office in all fifty states (up to 142,000 elected officials nationwide). Much more to say as well about the technical choices to be made down the road by the City Council & NYC’s DoITT in building the petition platform, should it proceed, as it hopefully will – our AskThem is a Ruby on Rails web app, the Drupal code for We The People is open, and other solutions exist. I strongly advise the council to include an open API with this new petition platform, so that popular petitions from AskThem, or Change, or We The People – can be delivered into the new NYC software, and receive timely responses. More to say on that front as well. We’d love for more council members to volunteer to respond to public questions now on AskThem being raised every day, on participatory budgeting & traffic safety and more – it’s working, and we could use more support. 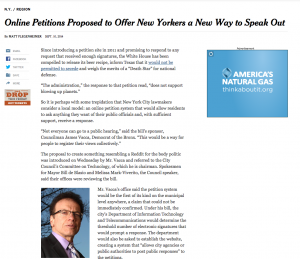 I’m very pleased that my 2013 demo of AskThem (then in beta) at the Transparency Camp un-conference in D.C. helped to place responsive, open online petitions as part of the BetaNYC Digital Roadmap plan – thank you so much Noel and BetaNYC leadership for pushing things forward on this front. Our tiny non-profit PPF is proud to be a long-time member of BetaNYC, active in our awesome community, and to have AskThem listed as a community project. (Work with us anytime.) So it’s fair to say that our non-profit work played a role in the introduction of this new petition legislation by CM Vacca. We’re urgently searching for charitable funding support to bring our non-profit petition platform and best-practice community outreach to more cities and states. Drop me a line, david at ppolitics.org, or ppolitics on Twitter, to discuss what we could do with some support – we can bring a customized version of AskThem to your city government, or work with your local elected officials in structured, continual dialogue with the public, in an open forum. My recent blog post goes into some of the unique features for productive Q&A on AskThem – we’ve been doing this for the better part of two years now, please help us with charitable funding to continue this work. And let’s move forward with petitions for NYC Council, and generate some interesting public responses to real issues.